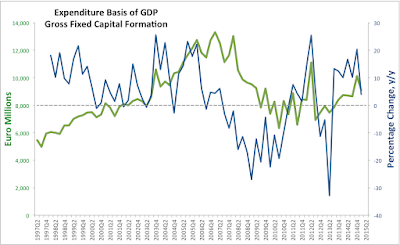 now, let's take a peek at the Domestic Demand component of GDP - the bit that covers Private Consumption, Government Current Expenditures and Gross Fixed Capital Formation. 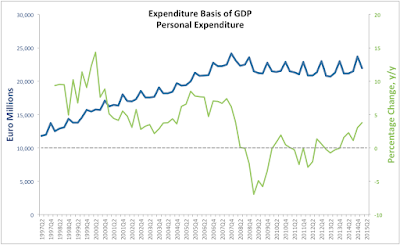 Personal Expenditure on Goods and Services by Irish households posted 3.78% growth year-on-year in 1Q 2015. This is faster than 4Q 2014 growth of 3.00% and faster than 1Q 2014 y/y growth of 1.56%. The rate of growth is also faster than four-quarters' average of 2.54%. So this is good news. In fact, this is the fastest rate of growth in Personal Expenditure since Q1 2008 and fifth consecutive quarter of y/y growth. Net Expenditure by Central and Local Government on Current Goods and Services was up 5.91% y/y in 1Q 2015, which is slower than 9.54% y/y growth reordered in 4Q 2014, but faster than 1.46% growth in 1Q 2014. 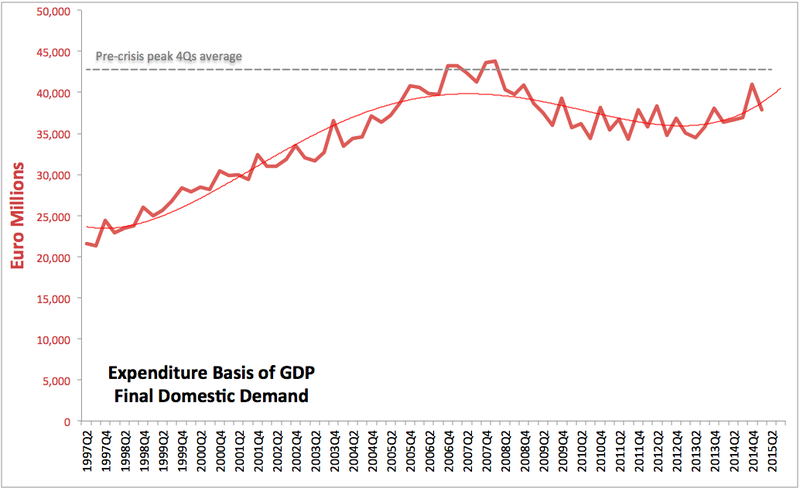 Current rate of growth in Government spending is slightly ahead of the four quarters average of 5.65%. 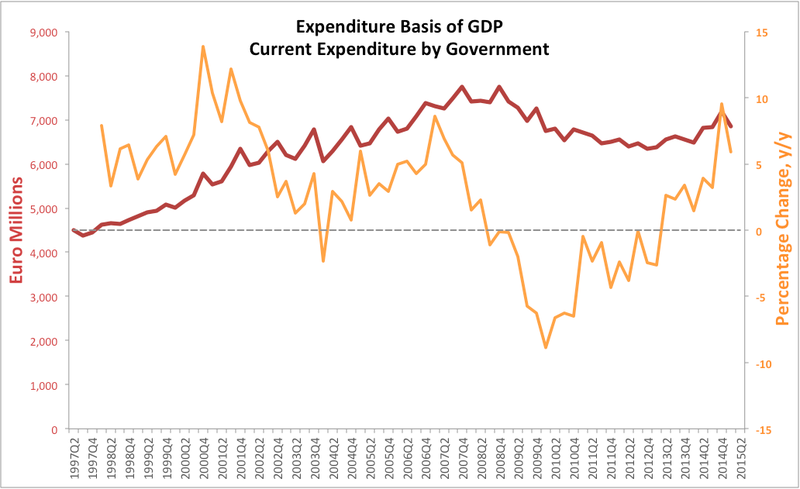 This is the second fastest rate of Government spending growth since 2Q 2007 and marks 8th consecutive quarter of positive growth in spending, full three quarters longer positive run than for Personal Expenditure. 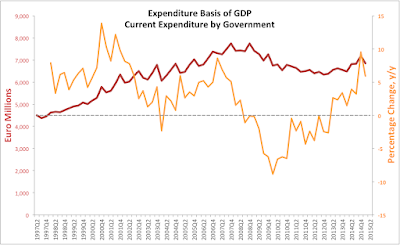 To compare the two series: austerity from 1Q 2013 on implies a rise in Government current (ex-investment) spending of 7.5%, while recovery in the economy means Personal Consumption rising by 5.4% over the same period. Gross Domestic Fixed Capital Formation (aka a proxy for Investment - proxy because it includes questionable stuff, like aircraft, as well as some of the MNCs-valued investments) was up 4.03% y/y in 1Q 2015 which is miles lower than 20.3% growth registered in 4Q 2014 when scores of punters rushed out to buy property, and when REITs continued to replace vultures in doing the same. 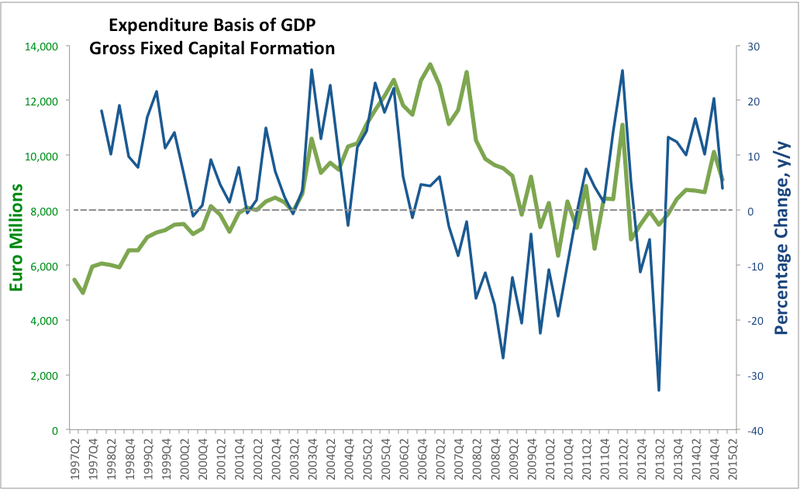 Over the last 4 quarters, average rate of growth in Fixed Capital Formation was 12.77% and even back in 1Q 2014 this activity expanded by 10%, so 1Q 2015 was a major slowdown in activity, albeit it remained positive. This might be a healthy sign of structural normalisation in what has been becoming a somewhat overhyped property market, but it can also be a short-term blip. Overall, 1Q 2015 was the slowest y/y growth quarter since the onset of the 'recovery' in the investment markets here in 3Q 2013 and the first quarter in the period when growth rates fell below 10% mark (albeit 1Q 2014 actual expansion was 9.979%). 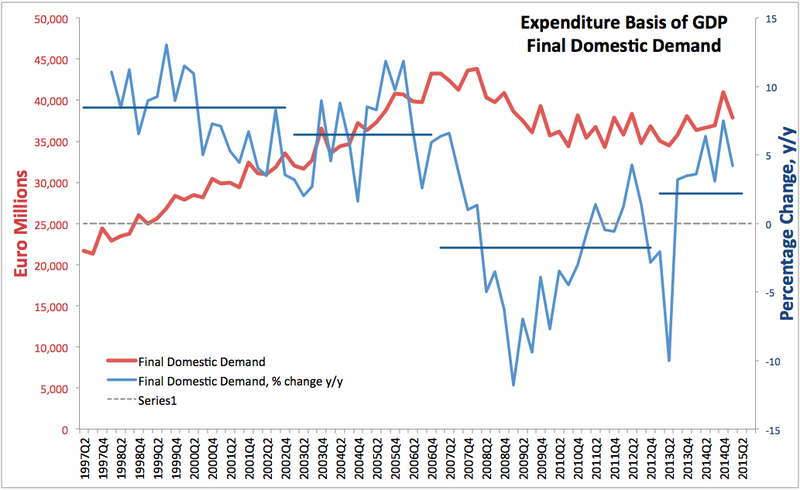 As the above chart shows, Final Domestic Demand rose 4.22% y/y in 1Q 2015, slower than 7.51% growth recorded in 4Q 2014 but faster than 3.61% growth in 1Q 2014. Over the last 12 months, average annual rate of growth in the Domestic Demand was 5.31% which makes 1Q 2015 performance relatively less spectacular. Still, 4.22% growth rate is a healthy one. As chart above shows, upturn in the Final Domestic Demand took place (on trend) around 3Q 2013 and it is gaining some momentum. 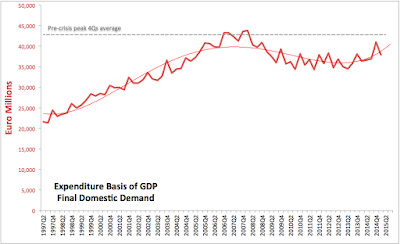 However, unlike the GDP series - posting full recovery (on rolling 12mo basis) to pre-crisis peak back in Q3 2014, Final Domestic Demand (domestic economy proxy) is still 11% below the pre-crisis peak. So while our MNCs-inclusive economic performance has regained pre-crisis peak, our domestic economy remains quite below the pre-crisis levels of activity. As shown above, single largest contributor to growth in GNP in 1Q 2015 (annual rate of growth) was Net Trade Balance (Exports less Imports) growth in which accounted for 33.81% of the total expansion in GNP. 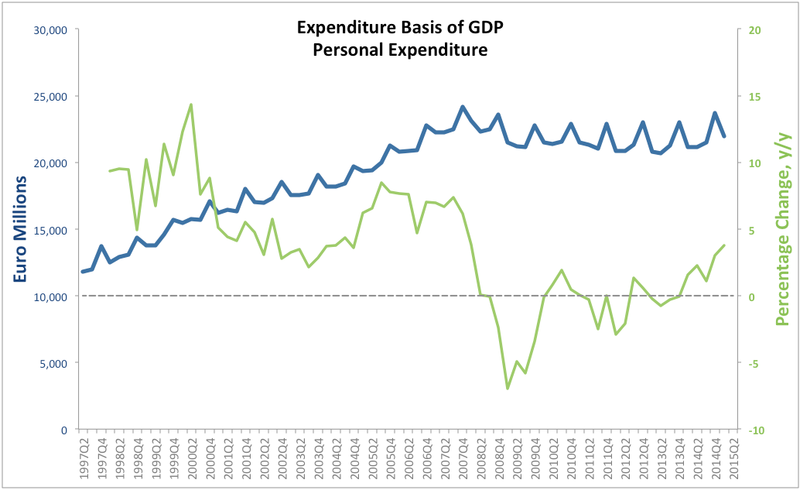 Personal Expenditure was the second largest contributor to growth with 28.83% share. Overall, growth in Final Domestic Demand (domestic economy proxy) was responsible for 55.4% of total growth in GNP over 1Q 2015 compared to 1Q 2014. Interestingly, inventories (Value of Changes in Stocks) accounted for almost 1/5th of total growth in GNP.